When Jeff Fisher took over as the head coach of the organization that would become the Tennessee Titans, the team was still located in Houston, Texas, and called the Houston Oilers. Jeff Fisher spent 17 years with the organization, 16 of them as the head coach, and he did not disappoint fans of the Houston/Tennessee Oilers/Titans during his time with the organization, as he consistently delivered a quality, competitive football program. Those days are over; Tennessee Titans head coach Jeff Fisher is stepping down after 16 seasons leading the Nashville, Tennessee, football franchise. The most prominent name on the list is that of Titans offensive line coach Mike Munchak, who is a favorite of Tennessee Titans owner and borderline nutjob Bud Adams. 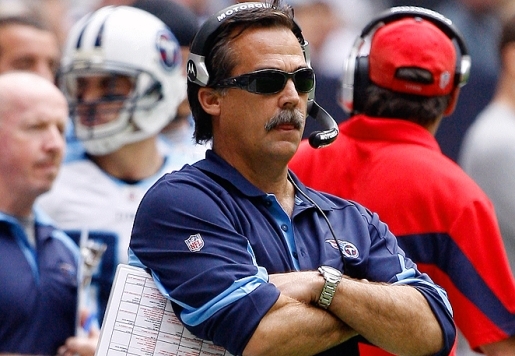 Adams is the reason Fisher is stepping down as Titans coach, no matter what they say. Bud Adams loves Vince Young, despite Vince Young’s lack of work ethic and mediocrity as an NFL quarterback, and Jeff Fisher was tired of having to deal with VY’s mental instability, general whining, and mood problems.